When the green option is also the best commercial solution. The Machflow is one of our three “Green Hand Dryers”. It achieves the impossible – better performance WITH better energy efficiency. Both drying times AND energy usage are slashed by up to 5 times. This is a dream come true for anyone wanting to improve the environmental performance of their buildings without sacrificing too much in terms of performance. You sacrifice nothing. The Machflow has the potential to make a big impact on your NABERS and GREENSTAR scores, while it also improves your customer experience and reduces your running costs. Dries hands in 8 to 10 seconds. Up to 5x faster than conventional hand dryers. Reduces electricity usage by 80% over conventional hand dryers. Purchase price is a fraction of the leading competitor. Slashes cost per use by 98% over paper towels. That’s right, cost per drying session gets down to around 2% of paper towels. Long life reduces total cost over time. High quality components, excellent vandal-proofing and the best warranty in its class make the Mediclinics Machflow a sound investment. Compact size and conventional wall plate makes floorplans easier to design. Conventional footprint and standard fitting holes reduce building costs for refitting and new works. Up to 7 x more energy efficient than conventional hand dryers. Around 10 x more energy efficient than paper towels (life cycle analysis). Up to 75% reduction in CO2 emissions compared with paper towels. Use of renewable electricity sources reduces environmental impact even more. Fast drying means more people actually wash their hands. This alone makes a significant improvement in hygiene. Most importantly, washroom patrons leave with hands that are completely dry, rather than moist. Fast drying times mean that people will actually dry their hands completely. Dry hands are much more hygienic than moist hands, providing much less opportunity for bacteria to multiply on the skin. Special vibration damping and various other advanced design features combine with high quality components and manufacturing, to create an exceptionally quiet unit. Note that most high-speed hand dryers produce more noise than conventional machines. The extraordinary feature of the Mediclinics models is that the noise produced is so much less than the leading brands, for equal, or better performance and energy efficiency. Variable fan speed means that the unit can be adapted to different uses. Fan speed can be increased to reduce drying time, or turned down to reduce noise. The sleek modern design, with three designer finishes to choose from, means that it will look great in most washrooms. 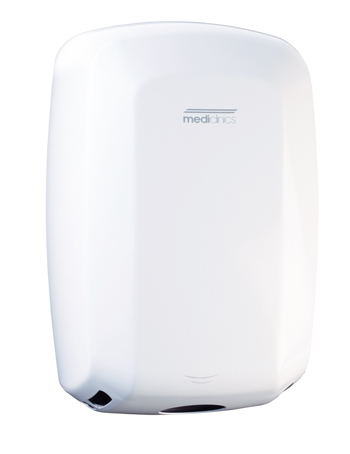 The Mediclinics Machflow hand dryer ticks all the boxes. It is a very environmentally friendly hand dryer. Energy usage is slashed by up to 80% compared to most conventional hand dryers. In fact, energy usage is even around 30% less than the leading brand of high-speed hand dryers. It will make a significant impact on your NABERS and GREENSTAR scores, especially if your facility experiences high washroom traffic. It is also very, very fast. Hands are completely dry in 8 to 10 seconds. Despite it’s prodigious speed, the Machflow only produces around half the noise of the leading competitors. The experience of your washroom patrons is enhanced – dry hands in 8 to 10 seconds is something we’ve all dreamed of. The Machflow has the beauty of being a high speed, high efficiency machine in a conventional, compact wall-mounted format. The Machflow range includes two Stainless Steel models; bright and brushed. 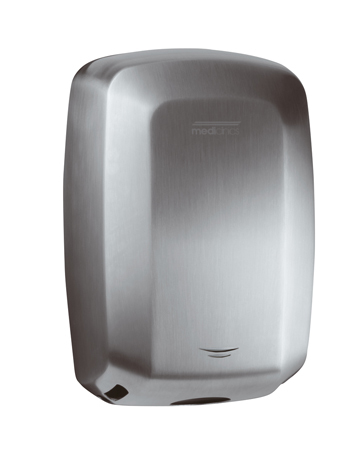 The Mediclinics Machflow hand dryer, above all, is a high quality machine. It is designed and manufactured in Europe to the highest standards, with all components sourced in Europe. Variable auto start sensor settings (5 – 25cm) to suit various situations. Standard fitting holes: Making upgrades from other brands easy. Soft starting function for the motor, extending operating life. The absence of a heating element creates a more robust unit. 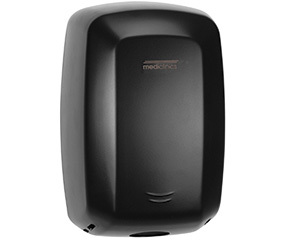 The Mediclinics Machflow is an extremely powerful and energy efficient hand dryer. It will reduce energy usage, increase customer satisfaction, reduce running costs, improve your NABERS and GREENSTAR scores – and it will continue to do this for many years. The choice should be very obvious by now. European design and manufacturing, backed with class-leading warranties, and brought to market at very competitive prices, all combine to make the Machflow hand dryer an extraordinarily compelling piece of engineering.